Program emulator of the terminal T0601 is designed to control from PC the remote devices via the serial interface RS-232/RS-485 (converter USB - RS-485) using the Modbus RTU communication protocol. And also for debugging software and hardware products, which is composed of control terminal T0601. 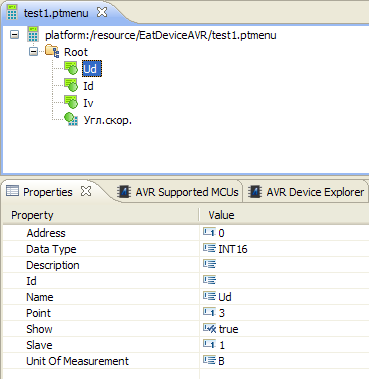 The emulator can be used in step debugging / testing of industrial automation - controllers, remote peripherals and other devices supporting Modbus RTU protocol as a slave-devices. 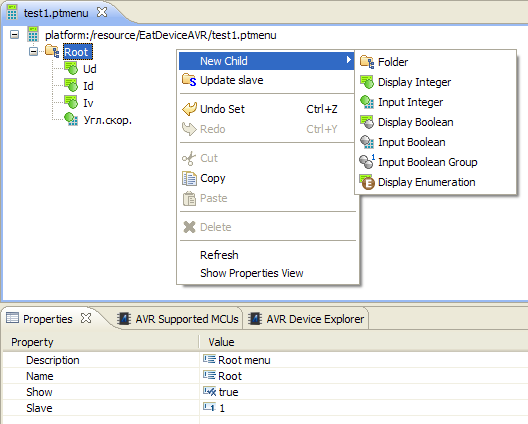 Program emulator serves as a Modbus master device. Reading data function performed Read Holding Registers (code 0x03), one for each register request. Writing of data is a function of Write Single Register (code 0x06). Creating and editing a hierarchical menu of the terminal is performed using a visual menu editor on the platform Eclipse (www.eclipse.org). The editor is built on technology Eclipse Modeling Framework (EMF). Folder - folder contains menu items. Display Integer - display integer value, with the ability to display a point in a defined positions. Input Integer - display and input integer value, with the ability to display a point in a defined positions, with lower (min) and upper (max) input value limitation. Display Boolean - display logical value, with the ability to display as an alias for the values ​​true and false - for example 0/1, yes / no, on / off, etc. Input Boolean - display and input logical value, with the ability to display as an alias for the values ​​true and false - for example 0/1, yes / no, on / off, etc. With the ability to input confirmation. Input Boolean Group - group of the Input Boolean items, If set of 1 of the logical item in group, the other group items are set to 0. Display Enumeration - display integer value, submitted text messaging. For example: a value of 1 - "READY", 2 - "WORK", 3 - "ALARM". Messages are elements of type Value, nested element in Display Enumeration. Input Enumeration - display and input integer value, submitted text messaging. Input a value is a choice from a text list. Messages are elements of type Value, nested element in Input Enumeration. Copy editor plugins in the Plugins directory Eclipse (C:\eclipse\plugins) from the archive file emulator.